Hello my name is Pandemic The Magic Bicycle. In response to a few people wanting to get to know me, I wanted to step out front confront my shyness and introduce myself. I am a Thorn Raven Touring bicycle. I am a beautiful rain drenched dark green and my frame is made of solid steel. I am tough, mighty and strong and roll all day thanks to my rohloff hub. My rohloff is an internal gear system has 14 gears and in constructed like a clutch and built into the back wheel. I get my oil changed with special light viscosity oil every 5000km. I don’t have a derailleur to slow me down or get clogged with dirt. My gears change on the fly, fast and with ease which is great for stop and go traffic and steep hills. I am a reliable bicycle for bicycle touring and was purchased because my owner had 7 cars the year she left Alaska and decided to put down the tools and give up tinkering for good. I have handmade well constructed wheels. I have never broken a spoke. In fact when I was purchased my owner tried to buy some extra spokes in case mine broke. The man in the bicycle shop laughed and said we build those wheels strong enough for 400 pound men. You won’t need extra spokes, turns out that the wheel builder was right. In the last year and a half nothing has gone wrong and there has been a minimal of repairs. I have had 4 sets of tires, one new set of brake pads and updated the break cables to high grade steel. My Queens throne, my saddle in which she perchs to see the world is a leather Brooks saddle and my pedals are double sided Shimano spd pedals. My rider wears keen spd cycling sandals and can barely keep them on her feet because they have been repaired many times and are poorly constructed, a disappointment from such a great company such as Keen. 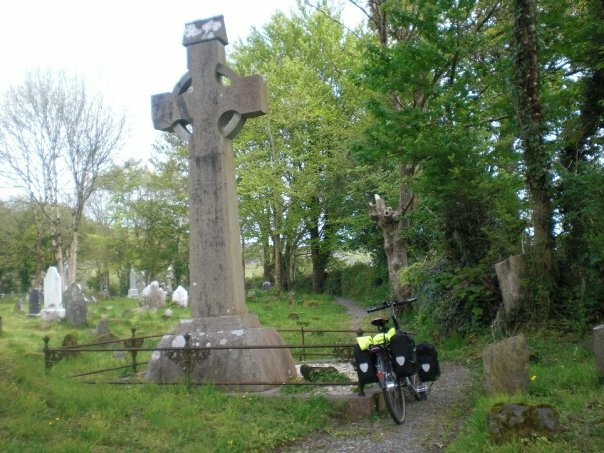 In Ireland at the start of the world journey when my owner was praying a lot about pedaling to Ireland prior to ditching the front panniers and condensing everything into 3 bags on the back. My rider doesn’t wear spandex, or believe that you need special shoes to go for a hike. 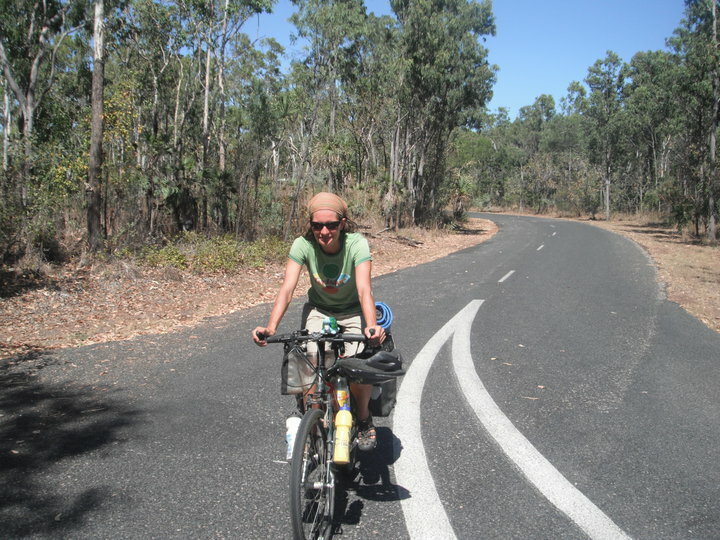 She pedals in regular clothes, bohemian cotton shirts, long hiking shorts and has been caught cycling in a skirt. She rides with 2 small Ortlieb panniers, one dry bag lashed to the back rack and a handle bar bag she made out of the top of a backpack. In the panniers are a Vaude Hogan Utra-light tent. However, last week she lost the tent poles and will be looking for new poles. My owner is a big fan of german made gear because it seems to last longest. Rohloff hubb, Vaude tent, Ortlied bicycle bags are all German companies. My tiny owner loves to eat and cooks on a MSR international multi-fuel stove, burns petrol as fuel, eats out of a non-stick pot with a broken handle and chopsticks. 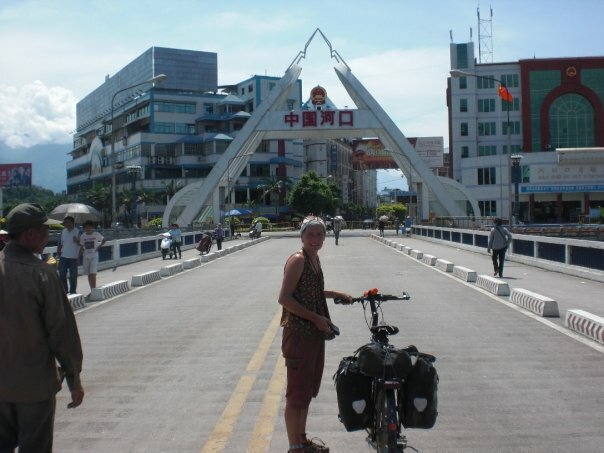 Chopsticks are the greatest invention for bicycle touring ever. Chopsticks serve as a fork, knife and stirring utensil. For eating and drinking she drinks and eats from a large tupperware container. Any item that has at least 3 uses has a home in my owners bicycle bags. It sure feels good to introduce myself in great length.